Distribution Known from the Moluccas (also known as the Maluku Islands) & is also widespread throughout many other islands & mainlands in South East Asia. Sexual Dimorphism First set of 'walking legs' (pereopods) are thicker in males. Females fuller bodied with a longer carapace. Water Parameters Freshwater. Close to neutral conditions are best. pH: 6.5-7.5, dH: 6-15 degrees. Extremes should be avoided. The filter feeding Bamboo Shrimp make an unusual addition to mature peaceful community aquariums with a high flow rate. Instead of claws, the first set of legs have evolved special fan-like attachments (or chelae) which the shrimp use to filter microscopic particles of food from the flowing water. Good filtration, clean and stable water conditions, along with decent water circulation is obviously a must for this species. 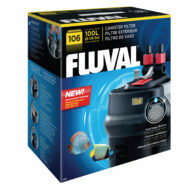 The current within the aquarium can be further enhanced by the use of small powerheads (be sure that the model you use comes with a protective cage or filter-sponge underneath to prevent the shrimp from being drawn into the motor). Flat stones and bogwood can be piled up in the path of the flow, where the shrimp will enjoy sitting with their fans outstretched, collecting fine food particles. Bamboo Shrimps are fairly sociable and should be kept in groups. On occasion, they may become a little territorial with each other - more noticeable in smaller tanks, but they will not cause any damage to one another. The arguments are often over who gets to sit in the best area of flow! These shrimp can be kept safely with plants, although due to the water movement, hardier species should be chosen. Tankmates should be small and peaceful, and this can include smaller shrimp species such as members of the Caridina and Neocaridina genera. Avoid pufferfish, large barbs, large aggressive botiid loaches, most cichlids etc. Quite a variety of natural colours of this species are seen in the shops (beige, brown, even pinkish or dark red), and all sport a magnificent light stripe along the top of the back. They can also change colour quite quickly and dramatically to match their surroundings, a natural camouflage mechanism. Smaller specimens will moult fairly often, until they attain their adult size. 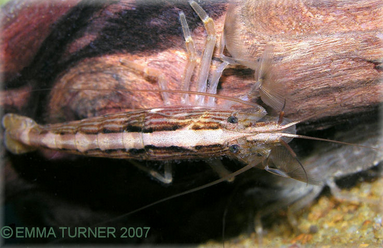 Moulting usually takes place overnight, and the shrimp may hide for a few days afterwards whilst the new casing hardens, as naturally this is when they are at their most vulnerable to predators. Care must be taken when carrying out partial water changes, as Bamboo Shrimp, like all shrimp species, are sensitive to fluctuating water temperatures. Try to ensure that the new (dechlorinated) water closely matches the temperature of the tank water. Some fish medications are harmful to shrimp and other invertebrates. If treatments do have to be used in an aquarium containing shrimp, ensure that it does not contain copper. These shrimp may initially be perceived as being of a slow and clumsy nature, however, they are actually very agile and are excellent climbers/escape artists. For these reasons, make sure your shrimp tank has tight fitting coverslides. May also be seen on sale as Fan Shrimp or Singapore Wood Shrimp. These shrimp filter micro-organisms from the water, along with tiny particles of fish food. The diet should be supplemented with tiny frozen foods such as cyclops and baby brineshrimp, along with regular feedings of zooplankton or phytoplankton and ground-up flake foods.